Reach candidates through an enterprise-grade texting platform. Why leverage the Jobalign Candidate Messenger to effectively communicate with candidates? With SMART Apply you have attracted a high volume of candidates. Now what? 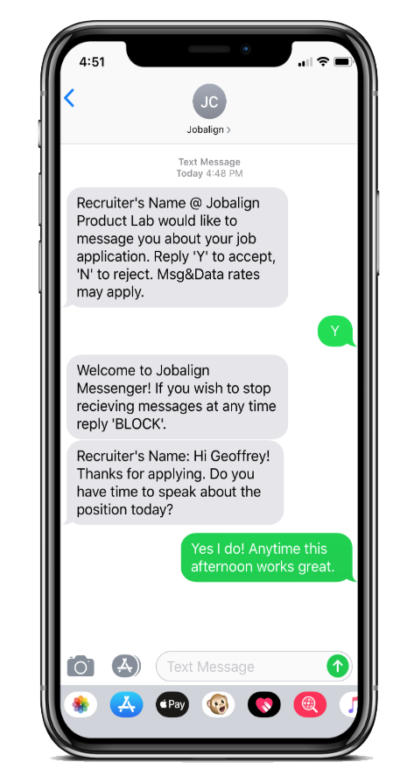 Jobalign’s Candidate Messenger enables recruiters to quickly engage those candidates through text. Messages are sent from any recruiter’s device and delivered directly to a candidate’s cell phone via text message. Jobalign Candidate Messenger is built in a fully TCPA and EEOC compliant structure with all data and text history available for search and audit. Job seekers expect the same timely communication they receive as a customer of a brand. Jobalign’s Candidate Messenger allows employers to protect their brand image while providing first-in-class service to prospective hires. Candidate Messenger allows recruiters to text candidates without having to use a phone. Candidates reply via mobile text. Recruiters get a higher response rate when reaching out to candidates for scheduling interviews, answering questions and filling roles faster. schedule a demo and engage candidates today.